... a cheerful spring wreath! I know what you might be saying. Hmmm, didn't you make a wreath, no TWO wreaths around the holidays? Gosh, you have a great memory. I did make two wreaths and shared them right here in December. After the holidays we over and decorations packed away, I missed the wreath on our door. Call me the crazy wreath lady, but there is something so welcoming about a nice wreath on your front door. I was inspired by the following two wreaths - one from brit.com and one from my dear friend jnelly - and finally decided to make my own! 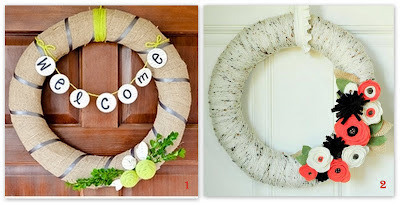 The biggest difference between this wreath and the ones I made for the holidays was using burlap instead of yarn to wrap the wreath. I love the texture but watch out - burlap is meeeessssy! Cut the burlap into strips (mine were 2 inches wide). I ended up cutting about 10 strips total. 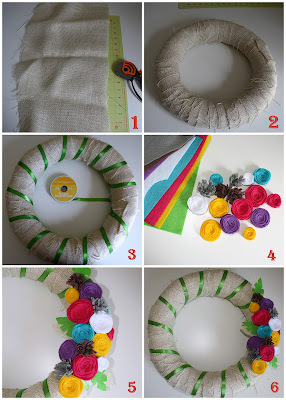 Wrap burlap around wreath. Glue each piece at the start and end. Overlap the next piece to hide the start/stop point. Yes, it feels like you are wrapping an ace bandage (or is that just me?!). Cut flowers, tufts and leaves out of felt. Arrange the all the pieces on the wreath and glue them down. I love the saturated colors, not too pastel and washed out, like some spring decor. this is adorable! I love the deeper colors as well. Thanks for sharing! You did a great job. Really bright and cheery. Thanks for sharing with Share Your Cup. I'm sure it's not intentional, but I do not see a link back to the party.